The UN's Office for the Co-ordination of Humanitarian Affairs (OCHA) has said 140,000 people are "in urgent need of assistance". 133 deaths with nearly 400 people missing and homes and crops destroyed. Murat Sahin, a UN official in North Korea, said the scale was of the disaster was "beyond anything experienced by local officials". While Kim Jong Un plays war games and spends millions of dollars building nuclear weapons aid agencies have warned that North Korea is facing a humanitarian disaster after tens of thousands of people were displaced by flooding. The UN and the International Red Cross say the government has reported 133 deaths with nearly 400 people missing and homes and crops destroyed. Rescue teams have been unable to reach some of the worst-hit areas. A five-story apartment building collapsed in North Korea's northern region after heavy rains and claimed the lives of 34 people, a source claimed Friday. The building located in Samjiyon county in Ryanggang Province bordering China collapsed on Wednesday due to a torrential downpour, according to the source, who declined to be identified. Seoul's intelligence agency confirmed that Ryanggang was hit by heavy rains in recent days. "We are checking whether 34 North Koreans were killed," said an official. The source said that the incident is a separate case from the collapse of a five-story apartment building in the border city of Hyesan on Monday. Kim Seong-min, representative of Free North Korea Radio, said that heavy rainfall and landslides earlier this week hit residential areas and farmlands in North Hamgyong and Ryanggang provinces. He said the building in Hyesan, Ryanggang Province, collapsed, leaving some 80 people trapped. North Korea's state media has yet to report property damage or human loss caused by the latest downpours. 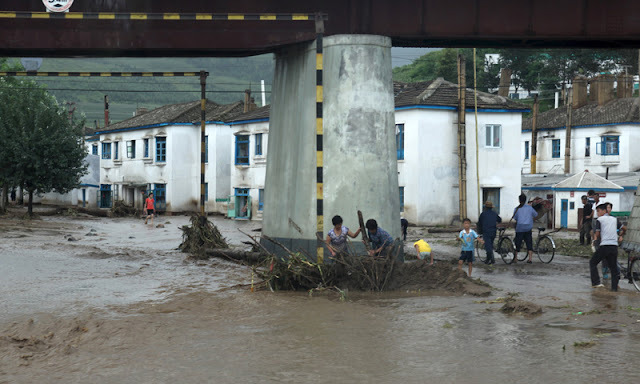 Floods 'destroyed everything' The worst flooding is along the Tumen river, which borders southern China reports the BBC. Many areas in Musan and Yonsa counties are entirely cut off, said the UN. Chris Staines, who is leading a Red Cross delegation in North Korea, said the region was facing "a very major and complex disaster". "The floods came through with such force, they destroyed everything in their path," AFP quoted him as saying. In some villages close to Hoeryong City there was "barely a building left unscathed".